2 - 4................Bordo von Fürstenfeld. 2 - 4................Cita von Fürstenfeld. 3,3 - 5,5..........Lump von Hagenstolz. 4,4 - 5.............Alex von Kleinwaldheim. Armin von der Eich is the product of two Angekört dogs and has proven to be an important sire for the working lines in Austria and Germany. He is grand-sire to ÖDK-Leistungssieger Armin von der Hochstede and great grand-sire to ÖDK-Leistungssieger Fello von der Hochstede. Armin was Austria's top show winner for some years and also won show championships in Yugoslavia. “This large, heavy black male was an Austrian and International Champion. At his first show he was only graded 'very good' because in the opinion of the judge his tan was too dark. Armin was a strong male with a good chest and substantial body, he had a good tailset, his head was good with good planes. He had a dark tan and dark eyes. Jack: SchH 3, ÖDK-Leistungssieger plus a winner of numerous show titles. Kira: SchH 1 and dam of the vom Dammberg “Q, S” litters (Sandra, Sonja). 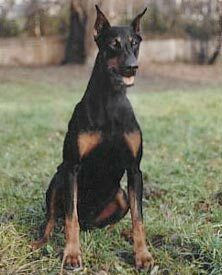 Coco: SchH 1 and dam of the von Bayern “H, I, J, L” litters (Heidi, Ingor, Jasmina). Cita: SchH 1, FH and dam of the von Hochstede “A, C, G” litters (Armin, Conny, Cora).